The inferior ulnar collateral artery emerges around 5 cm proximal to the medial epicondyle via the medial aspect of the brachial artery. It splits in anterior as well as posterior branches and also proceeds medially superficial to the brachialis. • The posterior branch intercrosses via the medial intermuscular septum to the posterior portion of the arm. • This particular branch moves laterally on the dorsal side of the distal humerus, deep to the triceps brachii to connect with the lateral side of the posterior humerus. • Toward the lateral margin of the humerus this particular section anastomoses along with the middle collateral branch of the profunda brachii. • The inferior ulnar collateral artery creates an arterial arch simply proximal to the olecranon fossa by this junction along with the middle collateral branch. • At the medial margin of the humerus, the posterior branch also might supply a branch that interacts with the superior ulnar collateral and the posterior ulnar recurrent arteries (posterior to the medial epicondyle). • The anterior subdivision of the inferior ulnar collateral artery, which exits the trunk at the medial side of the humerus, proceeds distally and move anterior to the distal humerus as well as medial epicondyle to interact along with the anterior ulnar recurrent artery. The inferior ulnar collateral artery supplies the only direct vascularization to the nerve in the area simply proximal to the cubital tunnel. 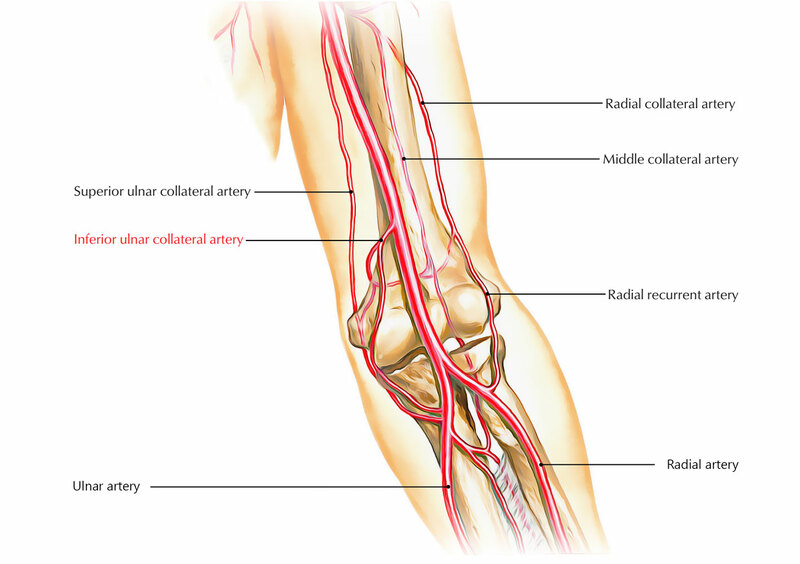 Current research studies have actually revealed that the inferior ulnar collateral artery (together with the superior ulnar collateral as well as the posterior ulnar recurrent arteries) supplies a segmental extraneural and intraneural vascular supply to the ulnar nerve. The inferior ulnar collateral also adds to the vascular supply to the medial side of the trochlea via a circumferential vascular ring which emerges via the inferior ulnar collateral artery at the level of the elbow.